In “A Change in Fashion,” vanishing, exaggeration, and boredom is a continuous theme that brings out the human experience of infatuation with what appears to be new and eventually boredom. Millhauser appears to be fascinated with vanishing and disappearing, which has been used in his other stories. The Hyperion dresses transform to be so big that the women can get out of them without anyone noticing. The dresses have become life-like. Similarly, the dresses consumed the women’s bodies, which protected them from “male control.” This part of the story seems to speak to the issue that women’s bodies are often sexualized by men particularly when there clothing shows more of their body. The idea of the dresses protecting them from “male control” is a representation of how men use how a woman dresses as an excuse for sexually harassing and sexually assaulting her, which is relevant to our society today (175). The allusion of Hyperion, who is a designer in this story is very ironic but is quite similar to how companies and designers choose their names. Hyperion is the god of heavenly light and is also known as the god that watches from above. Millhauser chooses this name to make the designer seem almost god-like and the designer chooses this particular name to show that he is the most powerful in the fashion industry. Just as Hyperion was defeated in Greek mythology and it led to his downfall, the designer went through the same thing. His true identity as a man who had no experience in fashion as well as the shift in fashion leads to his elaborate dresses becoming an object of the past. The nostalgia of the once fashionable clothing to the lack of remembering their extravagant details of beauty relay how the change in fashion and the changes in life, in general, can often quickly be swept out of sight and out of mind, but just as the Hyperion dresses showed similarities to the Victorian Era dresses, the Hyperion dresses or something similar to them would make its way back into the trending fashions of the future. This story basically highlights that fashion is never unique, but it appears unique to the people of that day. 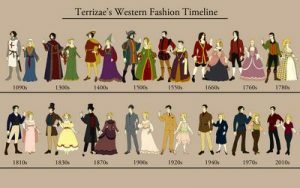 In reality, clothing that was fashionable in the past will eventually be fashionable again in the future, but it will be far enough in the future that people won’t see that its similarities to the past.